Corpus Christi staff, with assistance from U.S. 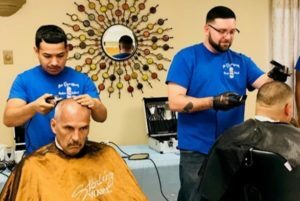 Probation, State Parole, Goodwill Industries, and the Texas Department of Assistive and Rehabilitative Services, held their annual job and resource fair for offenders and the general public at Victorian Hall. Del Mar College Transportation Training Services provided a simulation trailer as a means to train those interested in obtaining their Commercial Driver’s License (CDL). Hair Expressions Barber School provided free haircuts for those in attendance. Other employers and community resources participating were Ameritek Industries, Lowe’s Home Improvement, Catholic Charities, Alsco, Temco, Coastal Bend Wellness Foundation, Veterans Leadership Program, Del Mar College Continuing Education, La Playa Restaurant, B and T Rents, Kane Beef, Coastal Compass, the Attorney General’s Office, La Quinta Inn’s, American Auto and Collision Services, Omni Hotel, South Texas Vocational Technical Institutes, and Craft Training Center. The 100 attendees were also treated to a continental breakfast and lunch.